(91outcomes.com - Sep. 26, 2013) - Living with an illness can be challenging, but living with multiple illnesses can feel like pure hell. Twenty-plus years is a long time with little relief. Each day gets harder. Rolling out of bed slower, taking longer to get coherent, until one day, you just wish you could roll out of bed. Now, not only are Gulf War veterans ill, but employment capabilities become a thing of the past. Who is going to compensate lost income while you wait for claims to be processed? Who will help care for you? You become faced with a whole new set of problems to be concerned with. You can no longer drive. You need help completing basic tasks. Your spouse left their job to care for you and as a result, no longer has medical insurance. There is no money left over for your children’s dental or vision needs. Is your home going into foreclosure or your vehicle being repossessed? Our families should not have to worry about where our next meal is coming from. My name is Rebecca McCamick. 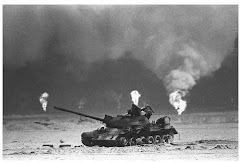 I’m married to a veteran of the 1991 Gulf War and we're very familiar with the lack of recognition and services provided to Gulf War veterans. Like many, we have fought our way through the cumbersome VA system and often times have run into a brick wall. I'm tired of watching veterans and their families suffer needlessly because of VA bureaucracy. Today, I’m advocating for all veterans who served prior to 9/11. The U.S. Department of Veterans Affairs (VA) has a program that would help meet most of the needs listed above. It’s called the VA Caregiver program. As a veteran, if you have an inability to perform one or more activities of daily living, need supervision or protection based on symptoms of neurological or other impairment, you would meet the program’s criteria for eligibility. In addition, you do not need to be a combat veteran or have a 100% rating to be eligible as it is intended to cover all service-connected disabled veterans who qualify. The VA Caregiver program would provide the caregiver of your choice with training, ongoing support, counseling, CHAMPVA health insurance, respite care, reimbursement for lodging and travel, and a monthly stipend ranging from $600-$2,000. Sounds too good to be true? Well, for veterans whose service was prior to 9/11, unfortunately, it currently is! 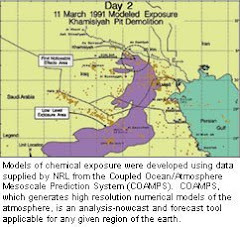 Although a permanent program, the current program was also used as a pilot program which the VA tested on post-9/11 era veterans, and Congress funded for the last 2 years. The VA has since reported back to Congress that the program was successful and therefore should be expanded to other era veterans. 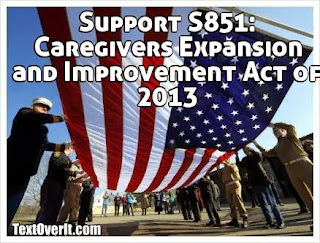 The Caregiver and Improvement Act of 2013 (S. 851) is currently being reviewed in the U.S. Senate. If passed into law, this bill would help expand the current Caregiver program to all eras of veterans who need caregiver support, not just those with post-9/11 service. Your help is urgently needed to ensure this program becomes available to veterans whose service was prior to 9/11. All it takes is a phone call to the House Committee on Veterans Affairs, at (202) 225-3527, asking them to pass legislation mirroring the Senate’s Caregiver bill, S.851. In other words, the Senate already has this bill but the House does not. This is what our charge is: to make this an all-inclusive program. Everyone needs to call, email, or write their Senators and ask them to co-sponsor and support the Caregiver bill, S. 851. And everyone needs to call, email, or write their Congressperson to ask that they help pass legislation in the House that mirrors the Senate’s Caregiver bill, S. 851. Without your help the bill will most likely die and veterans who desperately need the support of caregivers, but whose service was prior to 9/11, will continue to be excluded from this critically important program to support their continued care. As the spouse of a Gulf War veteran, I’m urging you to please contact Congress today to support our service-disabled veterans who need caregiver support. 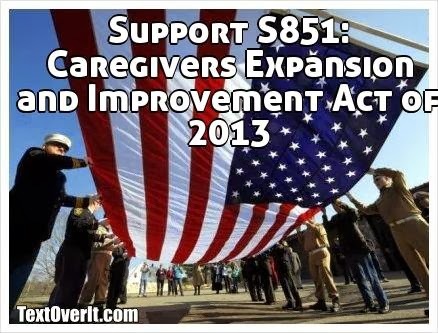 Supporting S. 851: Caregiver Expansion and Improvement Act of 2013: "This [Facebook] group is specifically advocating for the Caregiver BILL S. 851. Currently the VA’s Caregiver program is limited to post-9/11 veterans. This is a much needed program for ALL veterans. We will leave no veteran behind." S. 851 on THOMAS: CRS bill summary, bill status, full text of bill, latest actions on bill, bill cosponsors, and more. CBO Estimate, S. 851: Estimated cost to expand the program.